FastMinis Rear Shock Spring for the Yamaha TTR125. 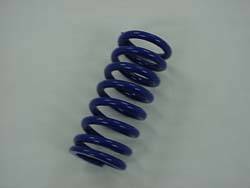 This shock spring is a more aggressive and an awesome replacement for that mushy stock spring. It will make it handle all the rough stuff far better than the stock spring. This spring is 32% stiffer than stock and is recommended for riders 140-200+ lbs. Aircraft grade chrome silicone wire for long life that will not fail like some other brands made overseas. Finished with a sharp looking blue powder coat finish!